GO KG is publishing Karakol Series, a number of articles about Karakol prepared by 'Leadership' Youth Volunteer Organization. 'Preserving the cultural heritage of Karakol' project was initiated by 'Leadership' Youth Volunteer Organization in cooperation with the Issyk-Kul District State Archive and 'Issyk-Kul Wave' radio station with the support of Internews. The project's objectives include the following: 1) contribution to the preservation of the architectural heritage of Karakol; 2) development of an interactive online map showing the historical sites of the city; 3) a media campaign to attract the attention of local residents and to develop civic engagement. More about the project is available here. ‘Leadership’ YVO team took part in the Laboratory of Media and Social Innovations in Dushanbe (Tajikistan) organized by the Internews Network in Central Asia from May 21 to May 23, 2017. Lab is a social project for solving socially significant problems and addressing the needs of inhabitants of Tajikistan, Kyrgyz Republic and Kazakhstan. Such events are a good tool to stimulate the participation of youth, civil society and the IT community in the implementation of socially significant media initiatives. Our team presented the project of ‘Creating an Internet platform about the historical heritage of Karakol’. Following the results of the Laboratory, a team of experts and mentors supported one idea from each participating country. Our idea became the winner from the Kyrgyz Republic, and thereby we won a grant to implement the idea. On the 1 of July 2017 the town of Karakol became 148 years old. Of course, it's not a serious age for a town, but when you look back and listen to the stories of our friends and relatives, you come to the understanding that it is a meaningful milestone in the history of Karakol. The ends of log cabins, patterned porches and balconies, intricately carved window and door frames and painted paneled shutters on the windows represent the main wealth of Karakol's architectural heritage. This unique reminder of the city's past is, however, under threat. The historical part of the urban environment is going through a period of transformation. Particularly alarming is the condition of the Karakol vernacular — it's becoming vulgar. You cannot make people care about their heritage, but you can foster interest and popularize history. Historical records recorded the exact date, reasons and circumstances of town's emergence. Historical records recorded the exact date, reasons and circumstances of town's emergence. Karakol is one of the first towns founded in Issyk-Kul Basin after the accession of Kirghiziia to the Russian Empire. In fact in 1865, after the voluntary acceptance of Russian command, there was an urgent need to erect defensive points and constructions to withstand the invasion from the Kokand Khanate. 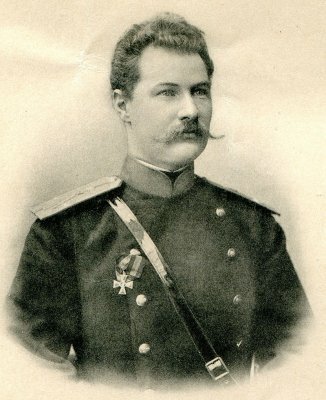 This mission was entrusted to Alexandr Vasilyevich Kaulbars, the Colonel General of High Command. He decided to relocate Ak-Suu fortification to a more suitable and advantageous place, as it was inconveniently located far away from caravan roads. After long and thorough analysis a place was chosen on the old and abandoned trade road, where once loaded caravans traveled to Kashgar. On the 1 of July 1869 the first streets, garths and defense barracks were laid. This date is considered as the founding day of the Issyk-Kul capital known as Karakol. Kaulbars had to choose a place to build Karakol. It was planned to erect the fort on new imperial land as a military administrative center. A comparatively small detachment made a topographical survey of the terrain, they outlined the location of streets and squares. On July 1, after the reconnaissance and collection of necessary information, as well as conversations with local residents, the town was solemnly laid. Preference was given to the area located at the intersection of the Karakol River and the caravan route from Chui Valley to Kashgariya. Karakol was founded precisely as a city, not as a town. Perhaps the name Karakol comes from the Mongolian 'Khara Gol', which means black river, or a river flowing to the north. Kyrgyz legend says that a long time ago the Kirghiz moving along the Balakhash steppes came to the shores of Issyk-Kul Lake. There, the unprecedented 'Kara' (black) people attacked them. It took the Kirghiz a long time to fight them off. As a result, this place was named 'Kara Kol' — 'Black Hand', after the black hands of the people who once attacked the Kirghiz 300 years ago. 'Kara' among the Turks also has the meaning of 'people'. Somewhat later, in February of the same year, a government decree was adopted to transfer the Issyk-Kul administration from Ak-Suu to the Karakol fortification. In the beginning the town grew only slowly and it seemed like it would suffer the same fate as Ak-Suu. In 1872 there were 150 inhabitants, mostly Tatars and Uzbeks, who came from Tashkent and other cities of Turkestan (the geographical designation for where Turkic peoples live). There were about 12 Russians, not considering the military, which consisted of an infantry battalion, two hundred Cossacks and a mountain battery. The main occupation of the inhabitants was trade in essential goods, which were readily bought by Dekhans from the neighboring villages ('kyshtaks'). Starting from 1875, the growth rate of the town slightly increased. Since 1890 settlers from Ukraine, the Central Black Earth Region (in European Russia), and the Volga region moved to Karakol. A particularly large influx of settlers came into the basin of Issyk-Kul Lake, including Karakol, after a crop failure in a number of provinces of the European part of Russia in the early 1890s. As a result, in 1897 there were already 8,108 inhabitants in the town, and by 1913 the number had almost doubled. The high population growth was due to the extremely beneficial natural and climatic conditions for cultivating land and livestock breeding. This fact was especially important for immigrants who had faced severe crop failures and famine in the 1870s. In Karakol there were educational institutions, a city assembly and public organizations: a merchant, an agricultural and even a race society. As in any, even a small, Russian town, there was also a theatre circle. Shopping arcades, a public park, barracks and cobbled streets complemented the picture of this small oasis, located at the foot of the Kungey Ala-Too. The horse farm founded in 1911 by Captain Vladimir Panovsky, 1914. Among the cities of pre-revolutionary Kyrgyz Republic, Karakol was a city of relatively high culture. An invaluable contribution was made by the participants of numerous scientific expeditions, which were led by the Russian Geographical Society, the Geological Committee and other organizations, to study and examine Russian and foreign Asia. Located at the very border of unexplored land, Karakol became a base, a starting point for the expeditions of Nikolai Mikhalovich Przhevalsky, Vsevolod Ivanovich Roborovsky, Petr Kuzmich Kozlov and many others. They prepared food, engaged guides, drovers, selected security and tested their equipment a last time before the before the long journey ahead. In the 1860s and 70s in the areas of North-Western China, the Dungans rose against the oppressors of the Ch'ing Empire. After suppressing the uprising, the ruling elite of China organized a punitive army led by General Zuo Zongtang. Dungan rebels saw rescue in Russia. 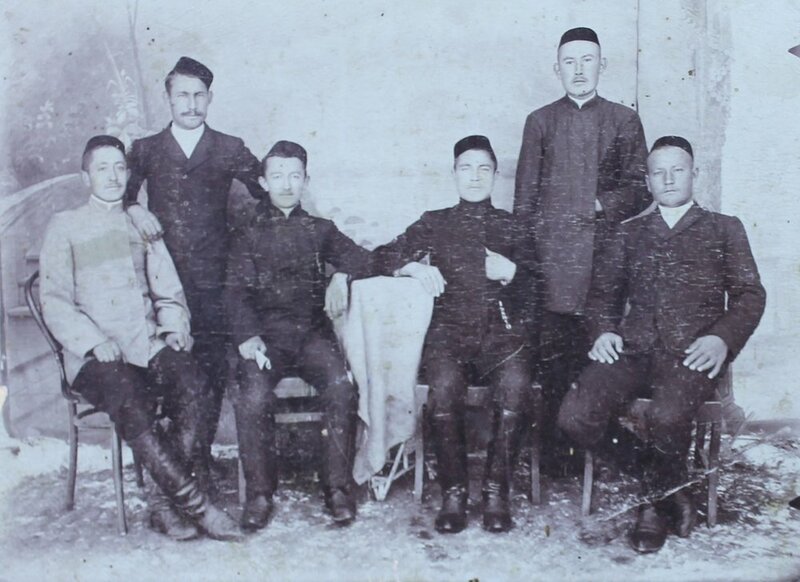 In November 1877 part of the Dungans, led by Dosifu, arrived in Karakol. At that time the population of the city was foremost engaged in cattle breeding and beekeeping. 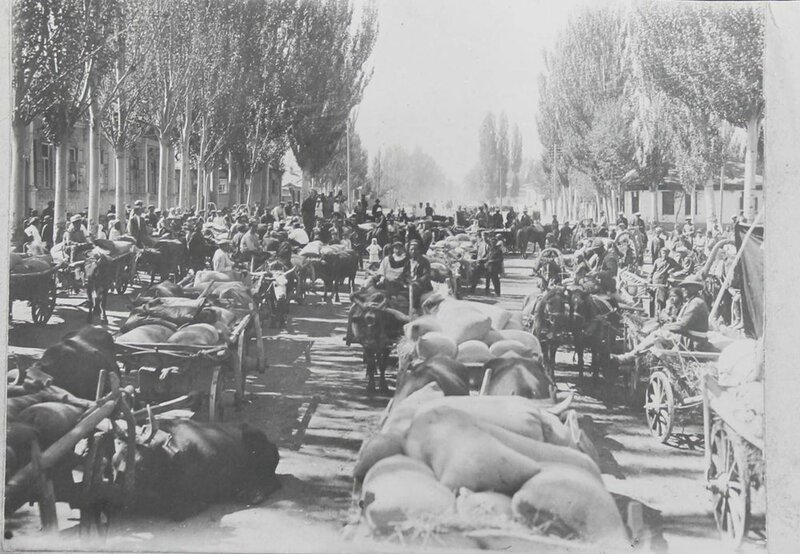 Mainly goods brought from Tashkent and Andijan were traded. It was of particular importance that a trade route passed through Karakol. At the end of the XIX century fairs started opening here with the purpose of selling goods from Russia, buying livestock and raw animal materials. In the early 1870s, Karakol resembled a small Russian village. There were only 80 houses and 52 shops, including barracks built of spruce logs cut down in the Karakol gorge. In 1872, the order was given to build houses only from raw brick made from clay mixed with saman. In 1881 there were six quarters in the city. But years later, in 1887, during the Vernensky earthquake, many houses made out of mud brick were ruined. Therefore, in the following years, wooden houses with decorated porches and cornices started being built again. The first industrial enterprises of artisan type appeared in Karakol in the early 70s of the XIX century. These were water mills on the river in the north of town. At the time, there were only five. The first industrial enterprise of Karakol can be considered the Toropkin brewery, founded in 1882. In 1913, according to the 'Siberian Trade and Industrial Yearbook', more than 60 industrial enterprises were operating in Karakol. These were tanneries, soap bar and candle production, greengroceries, sawmills, mills, woolen mills and two artificial water production factories. The equipment and means of production at the enterprises were primitive. The most common enterprises were mills that had very simple mechanism log units with a water wheel and primitive millstones. They were small huts built near mountain rivers. At 11 tanneries of pre-revolutionary Karakol all work was done manually. Tanning material was sent to Central Russia in large batches and was processed there. In return, finished leather and various footwear were supplied from Russia. The remnants that were obtained after dressing leather were used to produce glue. The city's glue makes was one of just two in whole Kyrgyz Republic. Additionally, four intestine-purifying facilities were counted throughout the country. Gut flushing took place manually. Finished and canned products were exported to Germany. 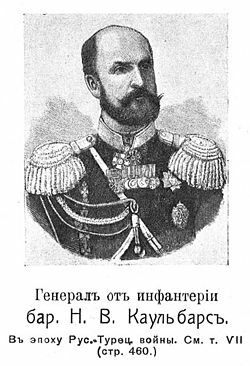 Among the mass of primitive enterprises, the largest and famous 'Vorotnikov' oil merchant in the Semirechenskaya region stood out. Oil produced in the Karakol factory was sold to Tashkent and Ferghana Valley as well as to China. This factory was destroyed during the civil war. Karakol wool-washing with its 100 workers was the largest in pre-revolutionary Kirghizia. Industrial production was supplemented with domestic crafts. Among the people engaged in crafts, there were many knife-cutters, stirrupsmen, spinners, fishermen and copper workers. The labour of saddlers, stove workers, carpenters, tailors, watchmakers and of masters of silver and gold was in demand. And yet, despite the relatively developed industry, the bulk of the population was engaged in agriculture. Beekeeping and gardening had commercial importance. Import was an important source of income for the citizens. This can be judged on the basis of next fact. Up to 800 trains were attracted to transport goods to the Karkarinsky Fair, which was held annually 80 km east of Karakol. A large number of vehicles were required for the transportation of various cargo coming from outside the Issyk-Kul region.